Seeing your kids happy and enjoying life to the fullest is the greatest reward for any parent, and one of the best activities we can share with them is going on a bike ride. 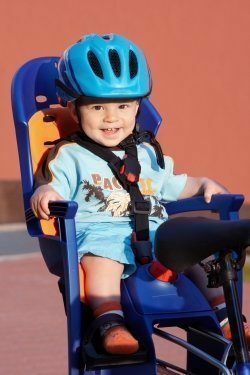 Your little angel may not be old enough to handle a bike on his own, but with the help of a safe, comfortable, and appropriate infant bike seat for his age, he will be able to ride with you and join you on your biking adventures. What is a Baby Bike Seat? A child bike seat is an easy, safe, and fun way to get around the neighborhood or park with your toddler or preschooler. They are saddles that are specifically designed to be mounted on your bike. They are meant to accommodate younger kids who are usually between 1 to 5 years old. These safety bike seats let you bring your baby along with you on bike rides comfortably and safely. They typically in a compact, durable, and light designs, and available in different varieties of mounting styles. Moreover, they are generally suitable for various bike specifications and matches the preferences of most parents. There are also carriers which bike-riding parents use in areas where traffic is very little or no traffic at all such as parks with bicycle trails. Front frame. You can usually fasten this infant baby seat between you and your ride’s handlebars. This will provide your baby with a warm and cozy security feel since your arms will have to go around the sides of the child seat to be able to use the handlebars. Rear frame-mounted. You can attach this type to the seat tube of your bike, and typically comes with safety features such as footguards and harness systems. A lot of rear-mount models today can be secured directly to the bike’s frame. Rear rack-mounted. This can be attached to the rack located at the back of your bicycle. You need to purchase a rack if your bike doesn’t have one or get a bike seat model with a rack inclusion. There are also high-end child back seats that feature reclining seats, comfortable suspension systems, and luxurious linings. Safety is the first and foremost thing you need to consider when shopping around for the best child bike seat. It is essential that the baby bike seat you’ll choose meets all safety standards set forth by the government. There are plenty of child seats available out there, and finding the right one for your child can be quite overwhelming. To make things easier for you, here are some important considerations you need to keep in mind before purchasing one for your child. Bike compatibility. Not every bicycle are designed to support an infant bike seat. Check the specifications of your bike and make sure that you can easily attach and secure your chosen model to it. Ease of use. The best bike seat for your bike should also be simple to install just like with child safety seats for vehicles. You should not have any difficulties or inconvenience when steering, disembarking, and mounting when cycling. It should also be easy to store and carry around. Look for foldable models with a carrying handle that’s built-in. Comfort. You and your baby should be both comfortable with the baby bike seat. It should come with a stirrup, closed armrests, and a seating that’s thick and padded. Moreover, look for a bike seat with a suspension system feature so that your kid will not feel every bump you’ll come across the road. Also, ensure that there is ample space for you to move around, and your road view is unobstructed. Safety. The bike seat you will purchase should at least come with an adjustable and padded three-point harness. However, if you want more protection, buy one with a five-point harness. Consider models with reflectors or add them so that your baby will be visible to others on the bike trail all the time. Protection. Check if it has some additional protection features that can protect your baby the spokes of your two-wheel ride, as well as the sun, rain, and wind. Durability. Make sure the child bike seat can accommodate the height and entire weight of your kid. The materials used for it should be able to last and handle different environmental conditions. Adjustable size. Your child grows every day, so look for a bike seat with an adjustable footplate so that it can adapt to his ever-changing height. Choice of color. Go for those with a light-color plastic shell since surfaces with darker colors tend to absorb more heat, which can be potentially harmful to younger children. Reading child bike seat reviews online can help narrow down your choices. Furthermore, you need to be aware of the different bicycle safety tips provided by the government to ensure you and your toddler will always be safe during your outdoor adventure. Use a rain cover when it’s not in use so that the seat padding will be protected from various elements like rain and dust. Use warm water with a little detergent solution and a damp cloth when washing its upholstery. Do not abrasive cleaning tools and powerful bleach when cleaning your kid’s bike seat to avoid damaging it. Check it regularly for signs of wear and tear to ensure that it is always safe for use. How Compatible is your Bike with your Baby Bike Seat? Properly mounting a bike seat is one of the most frustrating things for any parents. As mentioned before, not all bicycles are compatible with bike seats, while other bikes are only compatible with specific types or brands. The most versatile bikes are commuter bikes, hybrids, and your standard city bicycles. On the other hand, it is not ideals to use bike seats with specialty bikes like road, full-suspension mountain bikes, and those with a carbon frame. Before making any purchase, make sure that your bike is compatible with the seat you’re eyeing.